A jaundiced view of the war on Iraq, Green Zone has good intentions to tackle the duplicity that went into justifying the war, but suffers from both over-simplification and over-stretching. 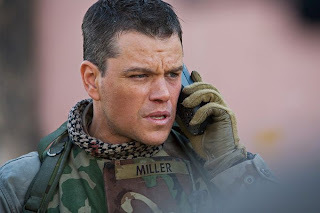 Immediately after the 2003 invasion of Iraq and the overthrow of the Saddam Hussein regime, Chief Warrant Officer Roy Miller (Matt Damon) of the US Army is in charge of a unit tasked with searching Iraqi sites suspected of housing Weapons of Mass Destruction (WMDs). After encountering nothing but long-abandoned sites, Miller starts to question the sources of the WMD intelligence. He is approached by Martin Brown (Brendan Gleeson), the CIA Baghdad Bureau Chief, who is skeptical about the WMDs, and is sure that unless the US reaches out to the leaders of the Iraqi Army and the remnants of the old regime, the country will disintegrate into Civil War and chaos. The informant Freddy (Khalid Abdalla) soon places Miller on the trail of a General Al-Rawi, a key Saddam loyalist and Iraqi Army leader. Al-Rawi is waiting to see if the US will turn to him to help keep the country together, otherwise he will unleash his forces in an insurgency. As Miller closes in on Al-Rawi with Brown's help, they are thwarted by Clark Poundstone (Greg Kinnear) of the Pentagon, who is manipulating the future of Iraq and has no intention of working with Al-Rawi or any other Saddam-era leaders. Miller finally finds his own life in danger after he starts to uncover the high-level manipulation that went into justifying the war. Green Zone reduces the WMD issue to blatant fabrication of intelligence and outright lying. It also portrays the Pentagon officials in charge on the ground in Iraq as consummate conspirators who will stop at nothing, including badgering their own troops and the CIA, to cover-up the truth. It all makes for good drama, but the nuance of partial incompetence and selective intelligence being a large part of any perceived conspiracy is missed, and the film loses credibility when the actions of Miller, Brown and Poundstone veer far from the bounds of reason. Green Zone also stops short of tracing the only real beneficiaries of a prolonged war ignited on a false premise, namely the ideological puppet masters and war weapons merchants. Placing the Pentagon's chief intelligence guy in Iraq in the role of main conspirator may be good for the drama but is otherwise a dead-end in logic. A sub-plot involving a Wall Street Journal correspondent who was manipulated into publishing false WMD reports prior to the war is an attempt to highlight the complicity of a brain-dead press in the build-up to the war. It succeeds only to a certain extent, and then becomes a cliched mechanism for outing the equally poorly researched new truth. Matt Damon delivers a typically solid day at the office as Miller, without ever needing to stretch. He is surrounded by generally stereotypical characters that populate many other war movies. The directing by Paul Greengrass is notable for its grainy, jittery, hand-held documentary feel, and the action sequences do deliver a street-level grimness. Green Zone has its heart in the right place, but sacrifices the complexities of the real story for the convenience of a more typical bow-tied cinematic experience.